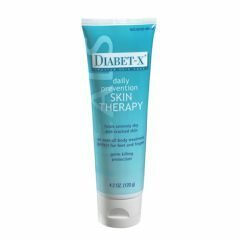 Diabet-X Cream is a gentle daily skin therapy for diabetics. Anti-fungal and antibacterial ingredients including Triclosan and Nonoxynol-9 help prevent infections. Re-hydrates, exfoliates and soothes dry, red, or calloused skin with rich blend of vitamins A, D, & E, aloe vera, urea and allantoin; promotes healthy tissue growth. I have not yet received this order. I called to check on the order on March 21 and the person receiving the call was going to check with the vendor to see what its status was. As of April 14th there is no sign of it or a communication concerning it. I like the product very much and have been out of it for too long. Diabetic damage. Lupus skin. Sensitive skin. Prevents irritation. Mature skin. Super sensitive skin. Multiple health problems. I have long standing Connective Tissue Disease and damaged super thin/sensitive skin and now Diabetes, with issues including neuropath. I have tried many products and this one is the least irritating and most protective product I've found. With regular use it helps me with the neuropathic sensation. Very light pleasant fragrance that doesn't stimulate my allergies or chemical sensitivities either. I use on my 91 year old father. His feet were dry &amp; flaking despite using regular lotion daily. This lotion has made a world of difference. Great for Diabetes patients and for those with dry skin. Has a very nice scent!. Easy to apply. Has a nice fresh scent. Helps with dryness. I use this product on my arms, legs and feet. Have a very nice fresh scent. I wish it could help with the pain sometimes that occur under my feet. Overall, I would buy the product again. How does it work? What is it targeting?